Ever since dealing with and working through my anxiety, going to church has never been the same. "Not having time to pray doesn't mean you're too busy, it means you're too confident." I don't know who said it or where I saw it, but my response was YES. That's spot on. But I don't think prayer is the only thing that fits that quote. I would venture to say that "go to church" could just as well be put in place of "prayer". It's true for me, that's for sure. Church is important and gathering together with other believers is crucial. I need my church. Just as much as I need to pray for others, offer help when needed, and carry friends' burdens, I need the same things for myself. The deepest and loneliest pits of life can really cause your perspective to change. For me, I was suddenly not a person who was in control (or so I thought) and who could take care of things on my own (or so I thought). I was weak and confused. I needed God and I needed God's people. That's what brings me back to my church each week. I can't get enough. I can't get enough of scripture and truth poured into me. I can't get enough of the prayers that are prayed over me. I can't get enough of the prophetic words that are spoken to me. I need it all. And I don't mind being someone who loves church. I know it's not really "cool" to love church and love church people and love how it all works. But I do. I played the cynicism card for a bit in my life and all it did was leave me empty. Holding on to hurt or dysfunction or wrong-doings that happened while I was part of a church didn't get me anywhere. (Also, a side note: Church does not equal God. Placing the anger or frustration you have with a church on God instead just doesn't work.) I'm not saying you may not need healing or time away or compassion from others. I'm not saying you're wrong if you feel hurt. I'm not saying it's not a big deal, because it is. I'm just encouraging you to push hard and lean into God until you get to the other side of that cynicism. Just because I kind of hate The Cheesecake Factory doesn't mean I hate ALL restaurants. And just because I may have had one (or two or three!) bad church experiences doesn't mean I should automatically write off every church around me. The beauty of living in The Bible Belt is that there are a million different churches that are run by totally different kinds of people who do things in completely different ways. Now, let's get this straight. 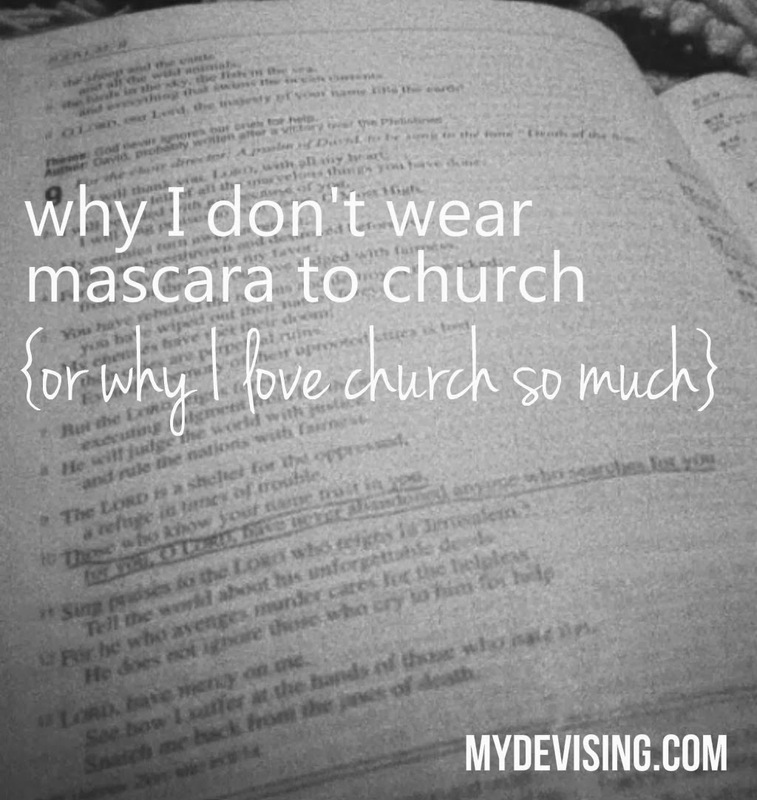 "Going to church" isn't the main thing. The main thing is Jesus. The main thing is understanding his story, accepting his love and forgiveness in your life, and giving that away to others every day. Church is just the frosting on top. Church has always been important, but its significance has greatly increased in my life. It doesn't replace my personal relationship with Jesus, it doesn't make me "a better Christian," and it doesn't equal my salvation. But it sure is comforting to have a place to go when I need to celebrate what God is doing in my life or weep with other believers who are walking alongside me in hard moments. And, really, that's what church is. Church isn't just a cute little idea to get me to look halfway decent at least once a week. It breathes fresh air into my soul. It energizes me. It reminds me of my purpose. It affirms what I know and teaches me what I don't. I hope and pray you each have a place that does that for you. Amen! I feel exactly the same way. What church do you guys go to? I love what you said about not blaming God for a bad experience with church too. I feel the same way about our church. I've never felt more secure in my relationship with Jesus, my husband, and all of our church family. Each week the fellowship and message breathes new life in me. Thanks for sharing! This was such a great post, Claire. I have been struggling with some of the things you mentioned and I really think you put it in a good perspective for me. Love you! Wow, Mrs. Westbrook. As well said as I've ever read (rhymes) on the beauty of the church. Not often you read a sentence starting with "The beauty of living in the Bible Belt is ..." Keep on writing!